Bell'O Digital are a brand that has grown from the original Bell'O A/V furniture company. They've made quite a surprising splash within the earphone market but are now plunging head first into the premium full size over-ear stereo headphone market. 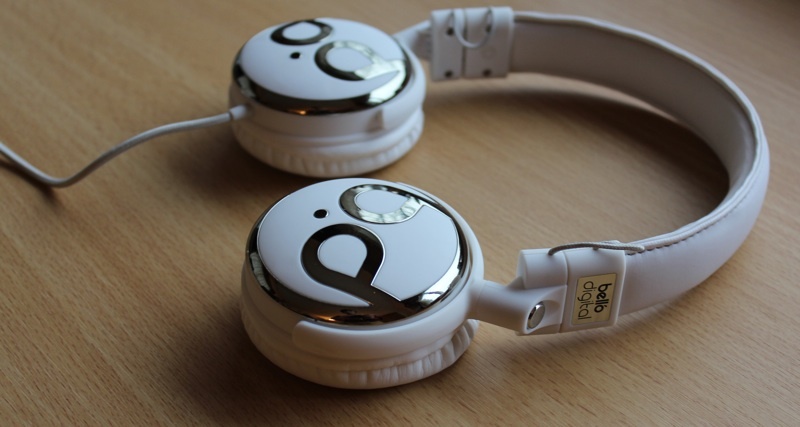 With the release of the Bell'O Digital BDH821 Headphones. The design of this pair of headphones is quite interesting. They come in two colours, one being a very sleek creamy white and the other is a black. The cups aren't skinny and flat like many newer releases thrown into the headphone market today. They protrude a decent amount away from the ears and have a rounded design scheme that does does make the bulk less apparent. The bigger cups should in theory deliver bigger and hopefully better sound, due to the space for bigger drivers. The cups ear cushions are very comfortable and have a nice amount of grip. But the pair that's attached to the headphones in the box is the only included pair, it would have been nice to at least see one set of spares. The headband is tightly padded and coated with an airy soft faux leather exterior, the stitching here is notably precise and will definitely provide long jeopardy. It's also very easy to adjust the height of the cups from the band and they stay firmly in the adjusted position set. The hinges holding the cups allow for around ninety degrees of swivel too. 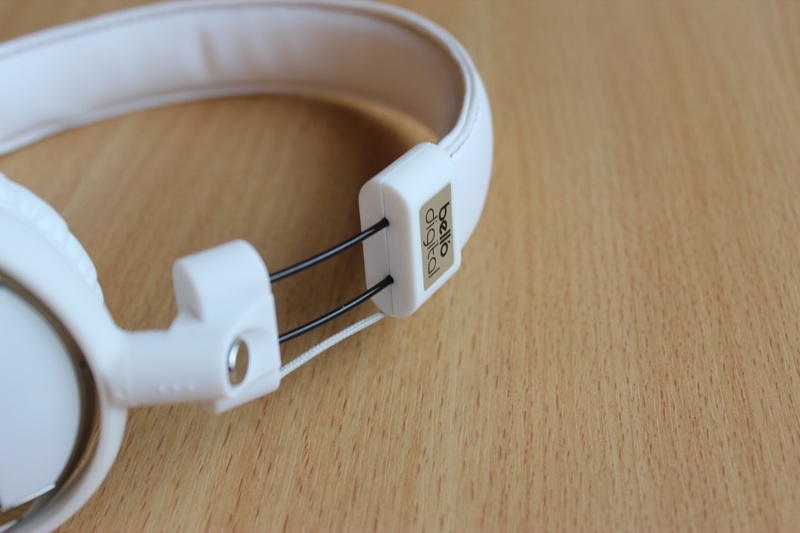 The hinge connects the cups and headband, it's made from a very light and soft in touch plastic rubber. We initially thought this was a bad choice for a conjoining material, but after a good amount of usage shoving these in bags and left crammed within draws, they've not shown any signs of cracking or wear. This soft rubber material has also been used on the exterior of the cups, it's definitely quite rugged, but it also helps to promote a lightweight design. Stamped in silver on top of the rubber material on the exterior of the cups is Bell'O Digital logo. It's quite reminiscent of another very well known headphone brand, if you know what we mean. One of our favourite design incorporations is the fabric covered reinforced cable. It resists tangling well and if a mild amount of tangling does occur the fabric makes it easier and quicker to manage. An all-in-one control and good quality microphone is found a few centimetres down the cable. It enables the user to answer and end calls, skip and go back on tracks and pause and play music. Compatible with the iPhone, iPod, iPad and Android devices. It works well but a volume control would have been useful. The cable features a 24k gold plated auxiliary plug too. Peddling onto audio quality, the main specimen. The Bello'O Digital BDH821 headphones produce a warm sound output. Audio incorporates a lot of bass, you can actually feel the bass on your head when the volume is cranked up. However low to mid frequencies can be a little muddy and confused at rare times but generally performance is good with sparky clarity. The mid to high frequencies sport brilliant definition of instruments when playing music and detail the strikingly good stereo performance. We've tested these across every main stream music genre and they are an across the board great performer. Very busy tracks the BDH821’s cope with brilliantly, they are very skilled at separating and delivering vocals from tracks clearly. Acoustic renditioning is tremendous too. We discovered that the warm and bass heavy audio output leant a great hand in movie watching, enabling an enjoyable and thrilling emphasised audio output within this area. What's quite astonishing is the RRP of $49.99. These give the very similar in sound Brainwavz HM3 headphones which carry an RRP of $89.99 (but can be purchased for around $50), a very competitive run their money. Bell'O have infused a truly spectacular bang for buck ratio with the BDH821 headphones. The HM3’s from Brainwavz provide a more precise less poppy sound output and the Bell'O BDH821’s have far more bass heavy output. It really depends on what sort of audio output you lean towards. Noise isolation is first class. Loud exterior noises don't sneak into the ears. However these headphones are quite the offenders in the noise pollution department, worth keeping a note of. Overall the Bell'O Digital BDH821 headphones are well built and sport brilliantly concise bass emphasised audio output at a very attractive price point.